"Through the courtesy of M. Gevaert, I heard in the Brussels Conservatory a double-bass oboe, whose tone had not he slightest similarity with the low tones of the bassoon. It was, down to the extreme depth, the typical shawm timbre of the oboe. If, in the near future, our ears should demand even finer differentiations of sound and a still greater wealth of tonal colors, we might re-introduce this instrument into the orchestra; thus, each individual timbre would be represented by a whole family group instead of the one or two members we have at present...."
Strauss went on to postulate expanded orchestral wind sections, the oboe section including oboe, oboe d'amore, english horn, bass oboe, and double-bass oboe. Needless to say, unfortunately the contrabass oboe did not catch on. The instrument at left is apparently one of a kind. It was custom-built by ORSI (Milan, Italy), and now languishes in a museum. Unfortunately, ORSI no longer has the plans or design specs to build another one. Note that it only resembles a tenor sarusophone: comparison with a modern tenor sarrusophone reveals differences in the proportions. 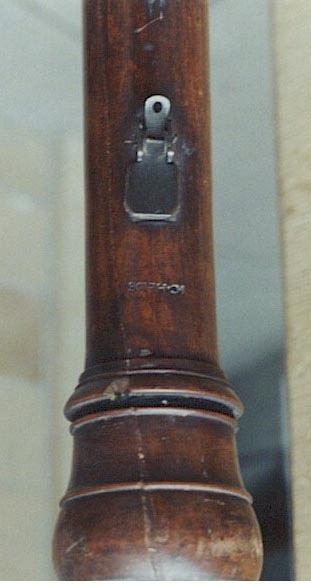 It would appear that, from the demise of the Grossbass-Pommer in the mid- to late-18th century, there were attempts to construct a true contrabass oboe 2 octaves below the standard, possibly to play in the same-family consort music still popular in Germany at that time or possibly to serve in a more general way as an alternative to the bassoon. A contrabass from c. 1740 by I.C. Heise of Kassel has recently been 'rediscovered' after spending many years in a private collection. This is an 8-keyed instrument whose keywork shows marked similarities to that of Eichentopf. The instrument descends to low B or Bb depending on whether a small hole near the bell is blocked or not (a practice familiar with the lower members of the crumhorn family). Manfred Hermann Schmid speculates that the instrument may have been used in the court of Burgsteinfurt which had a "Hautboistenbande" in 1782 and whose Kapellmeister, Johann Friedrich Kloffler, came from a musical family from Kassel. This would certainly agree with what Michael Finkelman writes elsewhere of the continuing practice in early 18th century Germany of using oboes in consorts. It is possible that notice of this instrument travelled to France for the maker Delusse made a contrabass oboe and, according to a musical almanac of 1781, this was effectively used by the Paris Opera bassoonist Lemarchand for about six months. Bate writes that this instrument was pitched in F and so a subbass or contratenor but, according to Michael Finkelman, it is actually a true contrabass. Finkelman also doubts from the size of the instrument that it is possible that it was actually played at all within the confines of the opera pit and that its success was a matter of appearance rather than size. Of its relationship to the true oboe family there is some doubt as its reed is apparently larger than that for a modern contrabassoon. According to Schmid the Delusse instrument which dates from c. 1760 is so close in appearance and design in both profile and keywork to the Heise one that it may well have been based upon it. The Delusse instrument has 9 keys of which 5 were probably added later. Garsault seems to describe this instrument in his Notionaire of 1761. He describes a "contre-basse du haut-bois" with 11 toneholes of which only 2 have no keys. However, with the probable retirement of Marchand in 1782, this experiment with the contrabass oboe was discontinued and no more is heard of contrabass oboes until the end of the 19th century. Although Loree planned to build a true contrabass oboe after completing his bass oboe in 1889, this never came to anything. His La Facture Instrumentale Pierre speculates as to the use to which this instrument, descending to low B, might be put and as to its possible tone colour but was never destined to find out. However, the firm of Orsi have (or at least had) in their museum an experimental metal contrabass oboe. The author is not aware of this instrument ever being used in performance and there do not appear to be any part in Alpine Symphony, which is scored well below the range of the normal heckelphone (down to low f#), was intended, as Joppig posits, for the contrabass oboe which Richard Strauss notes having heard played in the Brussels Conservatoire "the tone of which had nothing at all to do with deep bassoon tones" (assuming that it was not a bass sarrusophone which he heard). The Orsi instrument is not identical with the sarrusophone as photographs in Joppig's article show. Joppig, Gunther: Die Entwicklung der Doppelrohrblatt-Instrumente von 1850 bis heute und Ihre verwendung in orchester- und Kammermusik. Frankfurt: Das Musikinstrument, 1980. Joppig, Gunther: "Sarrusophone, Rothphone (Saxorusophone) and Reed Contrabass", Journal of the American Musical Instrument Society, Vol. XII, 1986, pp. 68-106. Schmid, Manfred Hermann: 'Kontrabass-Oboe und Grossbass-Pommer: Zu Traditionsuberlagerungen im 18. Jahrhundert', Musik in Baden-Wurttemberg Jahrbuch, Band 1, 1994, pp. 96-121. Finkelman, Michael: 'Die Oboeinstrumente in tieferer Stimmlage, Teil', Tibia, Heft , 199 pp. Paris: Musee de la Musique.